Jehangir Shapurji (Jean) Bhownagary, (1921-2004) was born to a Parsi father and French mother and was educated between Mumbai and Paris, finally returning to Mumbai to work in 1939 as a journalist with Reuters. Jean wrote scripts for documentaries, cartoon strips and co-authored Gujarati comedies with Adi Marzban. He was also a magician, a member of Toc H Concert party along with Mehli Mehta, a ceramicist, a painter but most notably, an award winning documentary film maker, working with UNESCO for thirty years. He was twice seconded to the Indian Films Division and mentored S. Sukhdev and Pramod Pati. In 1954 he recruited the progressive artists including Tyeb Mehta, Akbar Padamsee and M F Husain to make short films. The latter’s ‘Through the Eyes of a Painter’, famously went on to win the Golden Bear in Berlin in 1967. Bhownagary’s films including Radha and Krishna, 1957, are a retelling of classic tales using Pahari miniatures. Raza, throughout his career, has been delving into the locker of Classical Indian Art Philosophies and incorporating them into the Contemporary or Now. Haut de Cagnes, acquired by Bhownagary directly from Raza, his close friend and colleague in Paris, is a testament to the achievements of these two great Indian luminaries. "It was in 1952 that I saw the first works of Raza, recently arrived in Paris from India. They were strange and unusual works: timeless landscapes, uninhabited cities detached from the earth, bathed in cold light. Schematized houses were linked one to another in an endless, sinuous chain, suspended in the air beneath a black sun. Through an original separation of light and shadow, Raza expressed the contrast of day and of night which haunted him ceaselessly"
From the mid 1940s to the mid 1950s, Raza’s preferred medium was gouache and watercolour. Haut de Cagnes is unquestionably the defining work of this period. As a young student in Bombay in the 1940s Raza had a burning appetite to learn and to acquire knowledge. He surrounded himself with painters, writers and musicians in order to ask questions and to listen to their thoughts. It was during this time that he met the French photographer Henri Cartier Bresson who was to bring about a turning point in his creative journey. Bresson had seen Raza’s work in 1948 and had found it full of ‘colour and emotion’ but lacking in construction. He directed him to consult the paintings of the European masters, namely Cezanne. He said to Raza, “a painting is constructed like a building on a sound base with walls, base, roof, doors, windows and if it does not have these it is fragile. Paintings are in a way similar; you have to construct a painting with a sense of geometry. Remember the name Paul Cezanne, he mastered construction in painting. His paintings are testimony to his sense of structure” (Vistar: S H Raza, ed: Ranjit Hoskote, Ashok Vajpeyi, Yashodhara Dalmia, Avni Doshi, Afterimage Publishing, Mumbai, 2012, p138). This meeting with Bresson fundamentally changed the direction of his art. Raza turned to the ardent patron of the Progressives Artists Group, Emanuel Schlesinger, for books on Cezanne and it stirred in him a desire to study the European masters first hand. After securing a French government scholarship in 1950, he made his way to Paris and spent his first years studying at the Ecole de Paris and mingling with a genial tribe of artists, going to the opera and the ballet and visiting the museums and galleries that exhibited the works of the European Masters he so admired. The experience had a significant effect on his painting. Raza began experimenting with ‘orchestration’ in his drawings and paintings using as the elements of construction the houses and churches of rural France. A love of landscape was deeply rooted in Raza since his very childhood surrounded by the lush forests of Madhya Pradesh, and the French countryside presented itself as a new opportunity for experimentation. As Raza says in a conversation about his early years, “the French landscape interested me in a special manner because there I had the message of Cezanne and the possibility of acquiring a technique, a certain understanding of form, values, colour relationships and the orchestration of these fundamental elements without which you are not a painter” (Vistar: S H Raza, ed: Ranjit Hoskote, Ashok Vajpeyi, Yashodhara Dalmia, Avni Doshi, Afterimage Publishing, Mumbai, 2012, p144). Haut de Cagnes depicts the small twelfth century hilltop village of southern France in the heart of the French Riviera. The village has long been a source of inspiration for numerous artists from Renoir to Derain to Modigliani, lending it the moniker of ‘the Montmatre of the French Riviera’. In Raza’s representation of the village, we glimpse the medieval ramparts and geometric houses stacked on top of one another, with the historic Grimaldi castle at the apex. 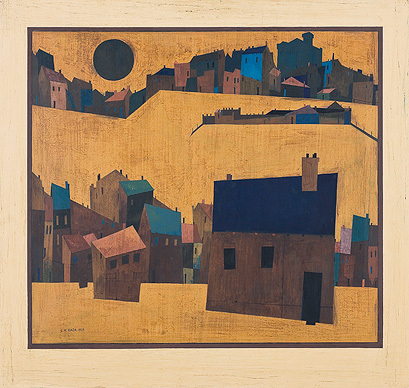 He paints the buildings as coloured blocks of differing hues - burnt sienna, brown, black, and blue on a striking backdrop of intense yellow ochre. It is a new type of landscape for Raza, one devoid of human presence and ultimately free from a sense of time or place. Rudolf Von Leyden refers to this as his ‘classic’ period, ‘a turn to clarity and order after the emotional upheaval of the expressionist phase’ (Rudolf Von Leyden, Raza, Rudolf, Sadanga Publications, Bombay, 1959, p. 18). As Von Leyden explains, “Each shape was carefully related to another, weighed, balanced till it had found its place in the composition which would appear unshakeable. Colour had undergone the most intricate studies to be able to express the finest overtones of a poetic situation. Because that is what these paintings really are: poetic situations. They were as austere and sensitive as the as the landscape backgrounds in the paintings of the Sienese primitives with their garlands of houses, walls and towers strung across the horizon” (Rudolf Von Leyden, Raza, Sadanga Series, Vakil & Sons, Bombay, 1959, p18). The influence of medieval European and early Renaissance art is evident in the stylization of the buildings, the flatness of the perspective and the use of natural colours against the ochre background reminiscent of the gold leaf used by the Italian primitives. “Simone Martini and Lorenzetti, appealed to him in their austerity which was capable of conveying the most exquisite poetic sensitivity” (Rudolf Von Leyden, Raza, Sadanga Series, Vakil & Sons, Bombay, 1959, p18). With such a mix of different styles and ideas one would expect to find a painting lacking in direction and lost in a confusion of forces. However, as Rudolf Von Leyden points out, “what we actually find are the precise determined and consequential efforts of a tidy scholarly mind which in the midst of contradictory influences has set to work to create order in himself, on his palette and on his canvases” (Ibid). In addition to an exploration of Raza’s artistic language when discussing Haut de Cagnes, one must also address the most striking aspect of the painting- the black moon hanging in the sky in the top left hand corner of the composition. Indeed, in early catalogues Haut de Cagnes is titled ‘Black Moon’. The presence of the black moon gives the painting a deep meditative quality that is elemental and primordial. We are glimpsing the very beginnings of what was to become a definitive symbol in his paintings, the bindu. Raza was first introduced to the bindu as a point of concentration, which subsumed all other thought, by one of his teachers in elementary school. The presence of a dark spot or area within his works grew stronger over his artistic career, moving from the periphery of the canvas to a central focal point. It was in the 1980s that his deep engagement with the concept of the bindu really took hold with it became a dominant element around which he would structure his canvases. It became a “compact energy pulsating in the night of the cosmos like a black star, the womb of the universe from which new worlds are on the point of exploding” (Rudolf Von Leyden, ‘Metamorphosis’, in Raza, Chemould Publications and Arts, Mumbai, 1985, unpaginated). For Raza the development of the black moon into an abstract symbol was not a move away from nature but a move to its very essence, an expression of nature in its simplest visual meaning, the form of the bindu as a compression or seed of all life in the universe. Haut de Cagnes is a rare window into the artistic journey that Raza would travel to become one of India’s greatest living artists.